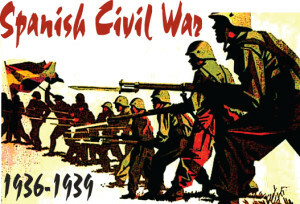 The Spanish Civil War (1936-1939), despite having little place in American cultural memory, is very important historically. It was arguably the first international ideological war (as opposed to, say, the French and Russian revolutions which lacked the international element). The left-wing government of the Republic was supported by the Soviet Union while the nationalist rebels, led by General Francisco Franco, received support from Nazi Germany. Yet, somewhat like Syria today, there were more than two sides to the conflict. Both the republicans and the nationalists were in fact coalitions. George Orwell (1903-1950) volunteered to fight for the Republicans, arriving in December, 1936 (the war began in July). and wound up in the anarchist militia, rather than the socialist or communist ones. He stayed for about six months and was wounded. Orwell is of course best known for his parody of the Bolshevik revolution, “Animal Farm” (1945) and his anti-totalitarian dystopic novel “Nineteen Eight-four” (1949) . “Homage to Catalonia” (1938), is his memoir of his time in Spain. There is some political analysis (for example, of the communists’ belief that Spain was not yet ready for a total revolution and so favored a bourgeois democracy while the anarchists favored a working class revolution). Mostly, though, the book is a personal reflection on, and reminiscence of, his own experiences One gets a strong sense of the boredom and terror of war. Orwell liked the Spaniards and does not escape a certain romanticization. (it is hard, I think, to be a leftist and to avoid sentimentalism); but this is mixed, at least a times,with clear-sightedness. For example, he writes, “The fact is that every war suffers a kind of progressive degradation…because such things as individual liberty and a truthful press are simply not compatible with military efficiency.” Yet this does not lead Orwell to give in to a despairing pacifism; it is simply an acknowledgement of a reality from which he refuses to hide his eyes even though he believes a war for a regime controlled by the working class to be justified. Orwell refuses to give up either his political convictions or his intellectual honesty. Perhaps the most passionate section of the book (in Orwell’s understated way) is his description of the fighting that arose between the communists and anarchists in Barcelona. Of this he writes, “In England political intolerance is not yet taken for granted…and the notion of ‘liquidating’ or ‘eliminating’ everyone who happens to disagree with you does not yet seem natural. It seemed only too natural in Barcelona.” We see here a man repulsed by the intolerance of the communists, a man who refuses to sacrifice decency on the altar of ideology. We have here, I think, the germs of his later masterpieces, “Animal Farm” and “Nineteen Eight-four.” “Homage to Catalonia” is at least as interesting an unintentional self-portrait of Orwell as it is of the war in which he fought. Another man who fought in the civil war, but on the side of the nationalists, was Jose Maria Gironella (1917-2003) author of the novel “The Cypresses Believe in God” (1953). It actually takes place in the eight years leading up to the outbreak of the war and focusses on the Alvear family who reside in Catalonia, though none of them is native to it. The wife is a devout Basque Catholic while the husband is also a Catholic but a strong supporter of the Republic. The book has a vast array of characters representing many different points of view. While some are more fully fleshed out than others, Gironella avoids turning this into a simple morality play. The differing political and religious world views are prominent and there is no attempt to make the political cleavages simpler than they were. This is a religio-political novel but the various ideologies most often do not overwhelm the characterization of the various persons. There are sympathetic and unsympathetic characters on both the left and right. I do not know if Gironella read any Orwell. I doubt that their paths crossed. They were of very different political inclinations, but there is a certain fundamental humanism underlying both these works, and a common appreciation for the particularities of Spain.